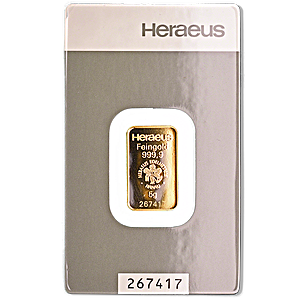 This 5 gram minted gold bar from Heraeus is a highly-finished investment gold bar from one of the world’s most respected precious metals refinery groups. Each 5 gram gold bar is fabricated from 99.99% pure gold. The front of each bar is imprinted with the bar’s weight, gold fineness, and the famous Heraeus refinery motif of a hand holding roses. The motif also carries a H which signifies Hanau in Germany, the global headquarters of the Heraeus group. The 5 gram Heraeus minted gold bar is 23.3 mms in length, 14 mms in width, and has a depth of 0.83 mms. All Heraeus minted gold bars are presented in their own secure plastic blister card, which doubles as the bar’s assay card. Each Heraeus 5 gram minted gold bar has its own unique 6 digit serial number. The Heraeus group was founded in 1851 in Germany, and the group is still to this day owned by the same founding family.